This flying season, NATS is proud to announce that it has collaborated again with Airbox to produce an iPad and iPhone version of the popular AWARE airspace warning and avoidance tool. The new AWARE software has additionally been awarded NATS’ new compliance mark for Airspace Awareness. This compliance mark indicates that the product meet NATS’ criteria for airspace awareness and infringement prevention and builds upon the success of last year’s Pre-flight Planning mark. The app replicates the functionality of the award winning AWARE device, launched in 2009 following collaboration between NATS and Airbox, which NATS believes has contributed to a decrease in the risk of airspace infringements. “With an increasing number of iPads in use in the cockpit, our intention is to encourage the development of products that will be a real asset to pilots,” said David Harrison, Safety Director, NATS. The AWARE app expands the functionality of the AWARE device by offering smooth map scrolling, improved high resolution anti-aliased CAA charting and an incredibly simple user interface. New multi-airspace alerts means pilots now can anticipate multiple complex airspace configurations in good time. 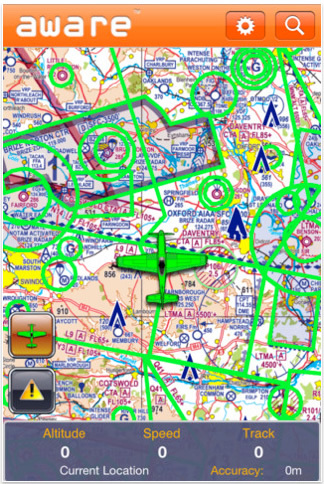 Airspace and new charts* are downloaded automatically to the iPad when the app is activated. A new emergency screen pre-populates an R/T Calling Card with pilot’s position and level to give clear guidance on what to communicate to ATC. Airbox and NATs worked together closely on this project, developing a joint requirement from research carried out within the GA community.